Current legislation has proposed mandated nurse-to-patient ratios for many states in an attempt to increase the quality of patient care. But do these new requirements really have a positive impact on patient outcomes? 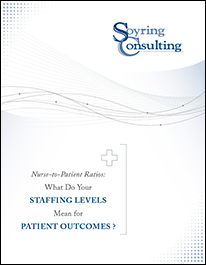 Download today to learn the truth about how your staffing levels can affect your patient outcomes and, ultimately, your bottom line. Soyring Consulting provides managerial and operational consulting services to healthcare facilities of all sizes, including For-profit, Not-for-profit, Community, University, and Faith-based facilities and systems. One of our key areas of focus is labor productivity and staffing. The Soyring approach to developing or validating benchmarks always includes outlining the unique factors that influence each department, and determining each department's optimal skill mix. We provide our clients with achievable metrics that are true to operational functions and can be implemented at the unit level while meeting financial goals.